A note from SIS: Please welcome guest blogger, multi published author, Jordan Summers! When I first started writing romances, my goal was to finish one book. I loved the idea of writing a book and being done with it, when I typed ‘The End’. The goal was to wrap everything up and leave the reader with a feeling of satisfaction when they reached the last page. About a year or two into my burgeoning (it’s still burgeoning *g*) writing career the focus at the publishing houses shifted. Everyone started to ask if the book I turned in was part of a series. As a new writer, I panicked. Most of the books I’d written (and there weren’t many) hadn’t been intended as a series. Of course I didn’t say that when they asked. *wg* Instead, I went back to my manuscripts and took a closer look at the storylines and the secondary characters. Even if you aren’t naturally a series writer, you may be someone who subconsciously puts enough elements in your book to create a series. I figured out fairly quickly that my storylines may or may not carry over into a series, but I had created interesting secondary characters——characters that I routinely received emails about from readers asking me when I planned to tell their stories. In writing classes, you don’t really learn that there are ways of getting around certain obstacles when it comes to writing a book and publishing. It’s not a subject that comes up. I had to learn how to create a larger story ARC. Fortunately, I’d introduced a large enough plot and world in RED to carry over for three books. 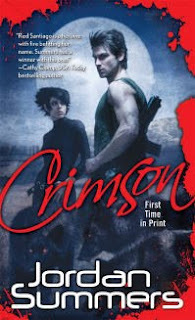 After finishing the series and having the final book, CRIMSON release last month, I have newfound respect for all the authors who have a continuing series that runs for more than four books. It’s tough. You have to make sure the characters stay true, create a plot for the current book, and keep the larger story ARC in mind (ticking along) at all times. It’s much easier in my opinion to write a stand-alone single title. That said, I’m glad that I had the opportunity to write RED, SCARLET, and CRIMSON. If I hadn’t, I would’ve never known that I could write a series with the same hero and heroine in all three books. Learn more about Jordan and her books by visiting her website and blog! Welcome to SIS. We are absolutely thrilled to have you! While series writing must be difficult, I would imagine it must be nice to get to keep your characters with you for a longer period of time. But then again, it must make it harder to say goodbye once the series is wrapped up because of the amount of time and the journey you spent with them. How do you feel when it's over? Are you excited to move on to the next cast or do you need some time in between to mourn and to say goodbye? I agree with Barb on that it must be hard to say goodbye to your characters. What or who inspires your story lines? Thanks so much for being here. As someone who has written two trilogies with different hero/heroines but a running secondary story... and a trilogy with same heroine/hero with an overall arc... and now, two stand alones... I find your post extremely topical, especially since I'm trying to decide what project to take on next! Question: As someone who has read both your straight ahead romance and urban fantasy (which is definitely grittier) I wonder if you have plans to continue with both? Or are are you leaning in one direction? Good points. There usually are good secondary characters and areas in the plot that can be set up as a series. I think it takes some skill to be able to use the same hero and heroine for three stories. It also take a skilled writer to set out to write a series and create a world that's viable and can grow to encompass new characters. A great post, Jordan. And that's what happens. People love the characters so much they want more. Exactly what an author wants to hear too! I found inspiration for RED from the Little Red Riding Hood fairy-tale. I really wanted to play with the story and its structure. I had no idea it would turn out post-apocalyptic until Red pulls her gun the first time. A lot of my story ideas come from science magazines. I subscribe to Popular Mechanics and buy several of the others. (Yes, I'm a geek. *ggg*) I see a medical breakthrough or an invention and my mind takes off with the possibilities. That's why Maglev technology features so heavily in my Dead World series. Every once in a while I get inspired by a movie. Normally it's when I think the writers and film-makers made a wrong decision. I tend to rewrite them the way that I think they should've gone. LOL! I definitely found keeping the same hero and heroine throughout the series the most difficult when it comes to the actual writing. It's so much 'easier' to have a new heroine and hero IMO. That said, I haven't totally walked away from romance. I'm trying to decide whether I'm going to adopt a new pen name and write something completely new like historical romance (I still love that genre a LOT) or write another paranormal romance (emphasis on the romance). Linda, You're right, every author wants to hear that people have fallen in love with their characters. "...Who can resist the new shiny work?" I hear you on that one, Jordan! I'm also soaking in all your responses. I never knew a lot of these things about you. Fascinating. Adult Urban Fantasy is waning?? Say it ain't so! Heard any rumors on upcoming trends? Just curious. After reading everything--sub-genre and genre wise--you want to cover. All I can say is, we're kindred souls! I, too, have been wondering if I might have to adopt a pen name in the future. There's so much I want to write! Of course I need to finish the current WIP first. Back to it! I'm not surprised. :D I know if I want to write more romance I'm going to have to change. Fortunately, I am not easily pegged in a genre, so it shouldn't be a big deal. Good luck with the WIP and your name change decision. It's not an easy one to make. Absolutely, Jordan. It's been a pleasure. Please visit us again very soon. I've had secondary characters rise up and insist on having a story of their own, and I've created an accidental trilogy (it wasn't planned that way, but about 1/3 in, it morphed and I realized I had a 3 part storyline that was going to be a lot bigger than I intended) but I've never had to go create a series from a standalone book. You rose to the challenge, though! It's good to realize that there are ways to pull the threads of story, character and world from a single story and weave onto it even if that wasn't the original plan.